Ever Dreamed of living on an Island? Snead Island's best kept secret, Amberwynd, a private gated community. This rare, 1.2 acre lakefront estate former Sterling builder model is perched on a picturesque, lush, tranquil setting. Enjoy gracious living in this stunning 3BR, 2.5BA Mediterranean home featuring a higher level of details expected in a home of this stature from impressive soaring 22+ft ceilings to an elegant staircase, custom built-ins and moldings. Elevator to all floors for convenience of the buyer. Meticulously maintained, new A/C 2016, new interior paint 2017, new pool pump 2017. Most all rooms face the wide vistas of the serene lake. Imagine mornings enjoying coffee on your wrap around lanai taking in natural wildlife & evenings poolside sipping wine, taking in the most sizzling sunsets & costal breezes. For boaters, Snead Island is conveniently located at the mouth of the Manatee River & Tampa Bay. 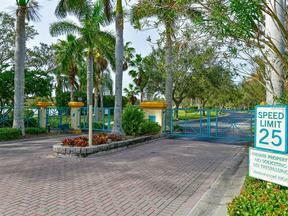 You have a choice of several marinas, public boat launch, 2 private dry boat storage & Bradenton Yacht Club minutes away. Walk or ride your bike to Historic Emerson Park, a 365 acre preserve, offers nature walking, trails, bike paths, Canoe/Kayak launching, picnic areas & observation tower w/breathtaking views of the Skyway Bridge. Conveniently located 30 minutes to downtown StPete/Sarasota. Looking for a slice of Heaven? Peace, serenity, security your Enchanted Island awaits you!